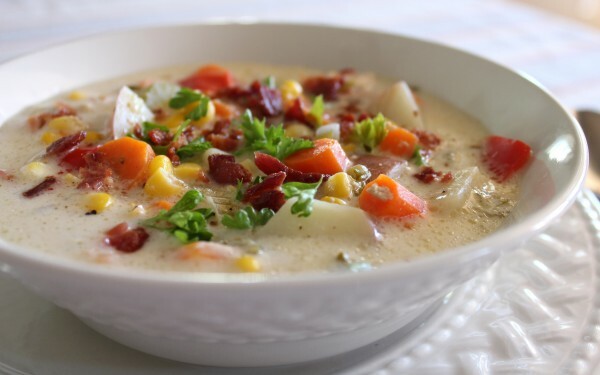 A new soup I’ve been working on is my Chicken Corn Chowder. This soup really does the trick on a cold day paired with toasty french bread and butter. From what everyone’s saying, this winter is going to be a cold, long one so you better stock-up on soups. I start making soups and chili to freeze in October, so our family always has something nutritious and homemade to eat around the house. This comes in handy with a young family on the go, like ours. Cook your soups and chili, cool, and then simply place in freezer bags. Freeze flat for easy stacking in your deep freezer and be sure to label your bags with the type of food and when you made it. In a large pot add butter and saute onions and jalapeño for 2 minutes, add garlic and cook an additional minute. Add potatoes and water and cook until the potatoes are tender. Add the rest of the ingredients and reheat to a slight boil and continue cooking for 15 minutes. Top with green onions and shredded white cheddar cheese.